Out of all the film pairings I have known, Jeanette MacDonald and Lassie would be among the oddest and least expected. The Sun Comes Up has as its major note to fame as being MacDonald's final film. I cannot say much about her appeal to the public, as she hasn't had much for me. I can say that it doesn't help her case when she's out-acted by a dog. Helen Winters (MacDonald) is an opera diva who has left the stage after becoming a widow to care for her only child, a son. However, with some prodding from her manager Arthur Norton (Lewis Stone), she has decided it is time for a comeback. Her comeback is met with a rapturous response, but then tragedy strikes: while attempting to keep their dog Lassie from running into traffic, Young Boy Winters is the one struck down and killed in front of Helen. Devastated, she withdraws completely, refusing to see Lassie. As a side note, this might be perhaps the only time, at least that I can remember, when Lassie is seen as evil. Eventually, Helen decides to get away and despite her own anger towards Lassie, finds herself taking her along. She eventually finds the hick town of Brushy Gap, where she deals with the hillbilly types and matches wits with general store owner Willie B. Willigoode (Percy Kilbride). There's a small house available for rent, so she takes a one-month lease on it. Helen finds the retreat somewhat healing, but she still is struggling. Into this comes Jerry (Claude Jarman, Jr.), a local boy whom eventually she hires to be her handy-boy. Jerry is enchanted by "Miss Lady" as he calls her, and despite herself she soon starts warming to Jerry and the local community. Helen finds out that Jerry is an orphan, and while she has grown fond of him she struggles with the idea of adopting him. Jerry for his part dreams that "Miss Lady" does end up adopting him, but Mr. Willigoode warns him against planning on such things. Eventually, Helen finds the strength to come back to her comeback, which means leaving Jerry behind. However, with some help from Lassie and a fire at the orphanage, along with some prodding by the rented house owner Thomas Chandler (Lloyd Nolan), Helen and Jerry find the courage to love again. 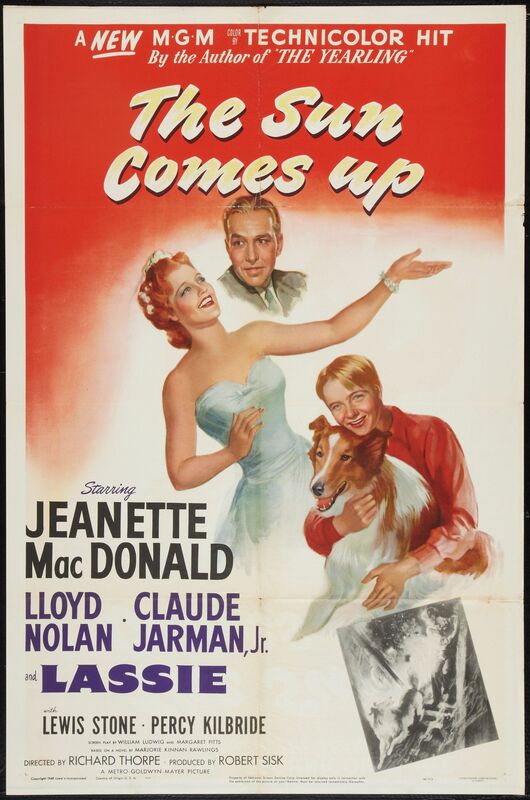 The Sun Comes Up is best for die-hard Lassie and MacDonald fans, but apart from seeing Jarman showing strength as a maturing actor the film is a bit of a slog to get through. The primary fault acting-wise is MacDonald. She is much too mannered and stiff as Helen, as if communicating her contempt to having a sheepdog substitute for Nelson Eddy. When she sings, such as her comeback performance of Un Bel Di Vendremo from Madam Butterfly, I can see why she was popular. Not my favorite rendition, but still a very pleasant one. However, when she sees her son die, the performance is so 'actory' to be totally unbelievable. Granted, there were a few funny moments, such as when she tries to fit into the local community by chewing snuff and clearly going about it the wrong way, but for the most part MacDonald seemed more unbearably snobbish than struggling with loss. Throughout The Sun Comes Up, you sensed MacDonald was more brittle than lost, and one ends up almost disliking her. It's a sign of how poor the script was that her son Hank went unbilled in the credits (performed by Dwayne Hickman, future star of the Dobie Gillis television series). There seems something almost perverse in suggesting Jerry could be a substitute for Hank. It might have worked better if she had just been a widow who decided to retire, rather than drag a poor child's death into things. Jarman was much better as the hillbilly Jerry, though his habit of calling Helen 'Miss Lady' seemed at times a bit bonkers. He was sweet and kind, the kind of person you thought yearned for knowledge and love; he has a great scene with Kilbride as they talk about lost hopes, and he has great interplay with Lassie. Lassie is the true star of The Sun Comes Up, and it wouldn't be a Lassie film without a fire rescue. The Sun Comes Up could have toned down the efforts at humor at hillbillies, showing them instead as wise in their own way. There were moments, such as when Willigoode tells a clearly unamused Helen that 'Truth ain't got nothing to do with manners', but for the most part I think we were meant to laugh at these uncouth country folk. Kilbride's slow delivery and wacky general store with its uncooperative till did not help matters. I do have a question about The Sun Comes Up. Helen is devastated by Hank's death, understandably so. Therefore, why is there a kids' baseball game going on in her yard? There's a story to be found in The Sun Comes Up, one that with some tweaking could have been good. However, with a stiff performance by Jeanette MacDonald, the film is perhaps best saved for those who love Lassie.